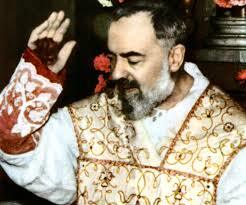 The stigmata on Padre Pio's hands and feet became visible and a wound in his side bled for the rest of his life. Summary: Pio of Pietrelcina, Religious. Born on 25 May 1887 in Pietrelcina (Italy); died on this day in 1968 at San Giovanni Rotondo (Italy). Raised in a deeply religious rural home, Francesco Forgione became Padre Pio when he was ordained in the Capuchin order in 1910. A mystic who received the marks of the stigmata in 1918, a renowned holy man, and a charity worker who founded a hospital (the House for the Relief of Suffering). His ascetic life of pain led to special compassion for the suffering. Honoured as an extraordinary confessor and spiritual director. Every day for fifty years from morning till evening Padre Pio heard confessions for the crowds who came to him, confronting and consoling. When he got the stigmata, the Church restricted his movements. But the crowds still came to him and many were cured. Patrick Duffy tells some of this holy man’s remarkable story. Francesco Forgione was born of agricultural worker parents in the village of Pietrelcina, northeast of Naples. He joined the Capuchins, taking the name Pius and was ordained priest in 1910. He began to experience pains and what he called “invisible stigmata”. During military service in World War I, he was sent on convalescent leave. In 1918 he contracted double pneumonia and was sent to a monastery at San Giovanni Rotondo, near Foggia, where he stayed for the rest of his life. The stigmata on his hands and feet became visible and a wound in his side bled for the rest of his life. The Capuchins made no attempt to hide his condition. The Vatican had him examined and he had to say Mass in private for a number of years. Pius would only say he was a mystery to himself. People for whom he prayed left donations. A new hospital complex was built and the place became a centre of pilgrimage and healing. A story of his being in two places at the one time is told by his superior, Padre Carmelo da Sassano. There was a concert one evening in the monastery. During the intermission Padre Pio folded his arms on a chair in front of him and rested his head. No one disturbed him and when the intermission was over Padre Pio sat upright and gave his attention to the rest of the performance. Next day Padre Carmelo called to see a sick villager. He found the patient fully recovered and the family delighted as Padre Pio, they said, had visited them the night before. 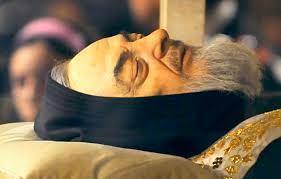 Padre Carmelo said that wasn’t possible, as Padre Pio had been at the concert. But the family insisted he had come and when asked at what time, Padre Carmelo recognised it was at the time of the intermission. 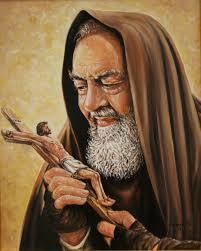 Penitents came from all over the world to confess to Padre Pio. It wasn’t always a comfortable experience. Sometimes he would reveal hidden sins to them. And if he discerned that someone was not sincerely repentant, he would shout out at them to leave the confessional. This usually provoked a crisis for the penitent, who would later return to Padre Pio with true repentance. On the fiftieth anniversary of the day he received the stigmata, while Padre Pio was saying Mass, people in the congregation noticed that the stigmata had vanished. He died the next day.